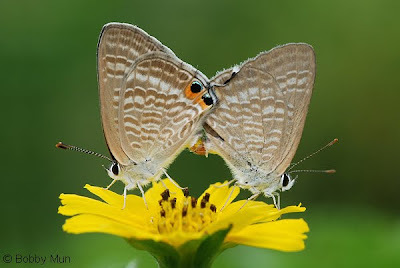 Uppersides of Pea Blue: female (left); male (right). Above, the male is dull purple with two black tornal spots on each hindwing. The female is brown with wing bases pale shining blue. Faint marginal spots and two tornal spots can be found on each hindwing of the female. Beneath, both sexes is buff in colour and have markings comprising white transverse fasciae in the distal halves of the wings. The black tornal spots in spaces 1b and 2 of each hindwing have metallic scalings and are orange-crowned. Each hindwing has a slender white-tipped filamentous tail at the end of vein 2. 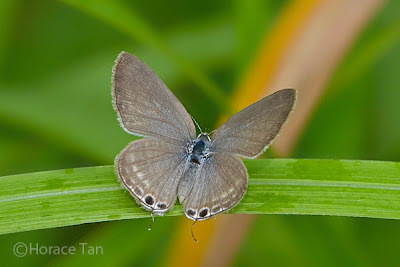 An adult Pea Blue resting on a perch in Pulau Ubin (a small granite island). 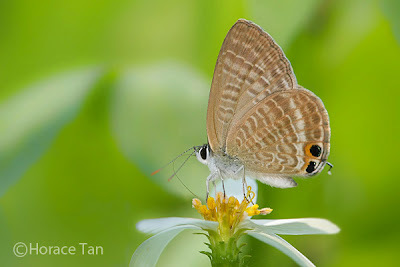 A male Pea Blue visiting a flower in a wasteland near the Dairy Farm Nature Park. 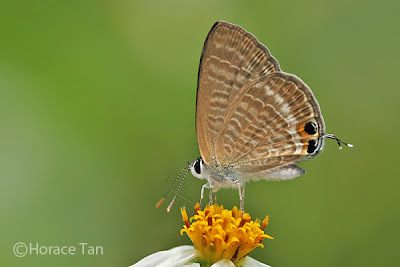 Another adult Pea Blue visiting flowers. 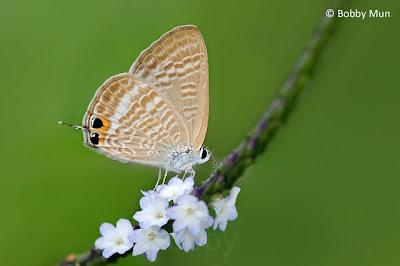 The Pea Blue is one of the most widely distributed lycaenids in the world with its occurrence spanning Europe, Africa, Asia and Australia. Due to its utilization of pea spp. as host plants, titis considered as a pest of pea crops in certain places. 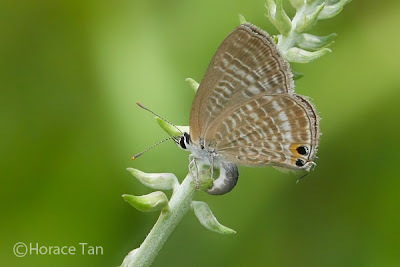 In Singapore, the Pea Blue can be found in various wasteland and coastal areas on both the main island and offshore islands where its local host plants, Crotalaria spp., are growing. Development of these patches of lands for housing and commercial purposes threaten to shrink its local population. Typically the adults can be observed whole year round, and are typically found flying in the vicinity of its host plants, visiting flowers and puddling on wet grounds. The adults are strong flyers with a jerky and rapid flight. The local host plant, Crotalaria mucronata, is shrubby with erect growth. The leaves are 3-foliolate with oval-obovate leaflets. The papilionaceous flowers occur in inflorescences and are yellow with reddish or purplish stripes. 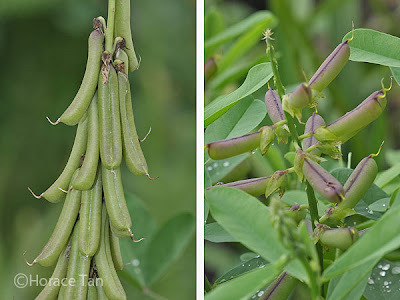 Seed pods are initially green but turning brown when mature.The other host plant, Crotalaria retusa, is 1-folioate and its flowers do not have reddish/purplish stripes. The first two instars of the Pea Blue have the habit of boring into flower buds and eating the flower parts contained within. The larger 3rd and final instar caterpillars will move on to eat the developing seeds within seed pods. 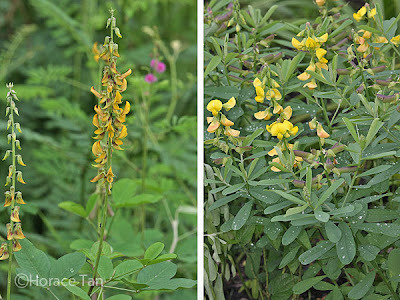 Host plants: Crotalaria mucronata (left); Crotalaria retusa (right). 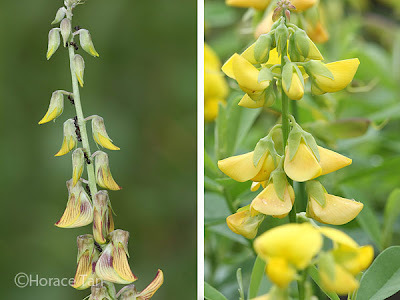 Flower buds: Crotalaria mucronata (left); Crotalaria retusa (right). Seed pods: Crotalaria mucronata (left); Crotalaria retusa (right). Eggs of Pea Blue are laid on young shoots, flower buds or leaves of the host plant. The small egg is disc-like (about 0.5mm in diameter) with a depressed micropylar. When freshly laid, the egg is yellowish green. The color soon decolorizes to light green within the next few hours, and then to white as it matures. The surface is covered with a reticulated pattern of intersecting ridges, and the intersections are prominently raised for those lying on the outer rim of the egg. A mating pair of the Pea Blue. A female Pea Blue laying an egg on a young flower bud of Crotalaria mucronata. 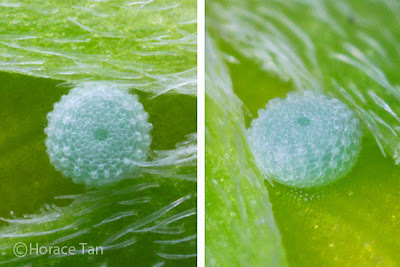 Two views of an egg of the Pea Blue. Diameter: 0.5mm. Each egg takes 2-2.5 days to hatch. The young caterpillar emerges after nibbling away sufficiently large portion of the egg shell. Measured at a length of about 0.8mm to 0.9mm, its pale yellow body is cylindrical in shape, sporting moderately long fine setae, a black head capsule and a dark prothoracic shield. Top: a newly hatched caterpillar about to bore into a flower bud, length: 0.9mm. Bottom: 1-day old caterpillar, length: 1.1mm. The newly hatched makes its way to a flower bud and starts to bore into it. It stays within the flower bud and feeds on the flower parts. After 1.5 to 2 days of growth, it reaches about 2mm in length, and faint reddish brown bands appear dorsally and laterally. 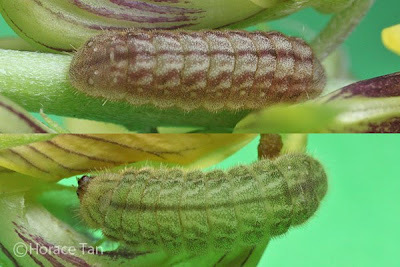 The moult to the 2nd instar typically takes place within the flower bud. 1st instar caterpillars, late in this stage, length: 2mm. The body was covered with pollens as both had stayed within flower buds moments earlier. 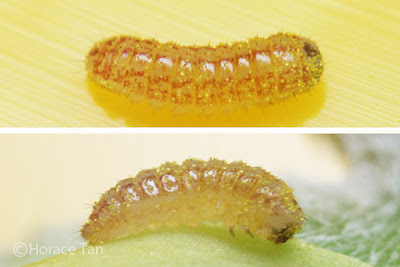 Covered with numerous dark setae, the body of the 2nd instar caterpillar is pale yellowish brown in base color with reddish brown bands running dorsally and laterally. The head capsule is still black in colour with a dark-colored prothoracic shield. The body is now more woodlouse-like in shape. The 2nd instar caterpillar maintains the habit of boring into flower buds and feeding within them. The growth in this stage brings the caterpillar to a length of about 3.5-4mm, and after about 2 days in this stage, it moults again. 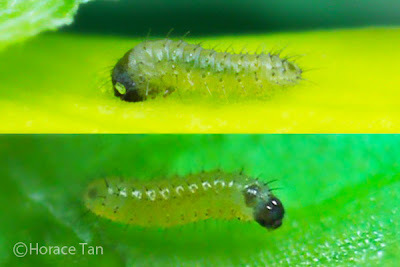 Two views of a 2nd instar caterpillar, early in this stage, length: 1.8mm. 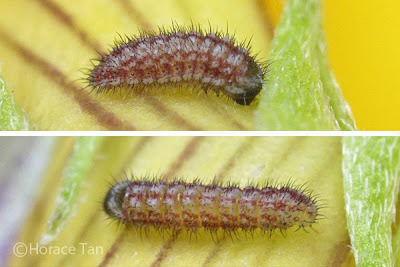 Two views of a 2nd instar caterpillar, lengths: 2.5mm. The 3rd instar caterpillar has numerous short and fine body setae. A faint dorsal band and many obligue lateral stripes are present. 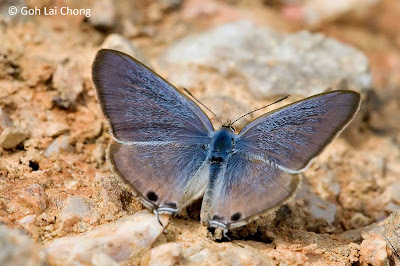 As with many lycaenids, Pea Blue exhibits chromatic polymorphism in larval color with the various body markings in green, reddish brown or intermediate coloration. The head capsule is still black but the prothoracic shield has decolorized to the body base color. Both the dorsal nectary organ and the tentacular organs are discernible in this instar. The caterpillar also migrate from eating flower parts to eating developing seeds within seed pods. The 3rd instar takes 2.5-3 days to complete with the body length reaching about 7.5-8.0mm before the next moult. 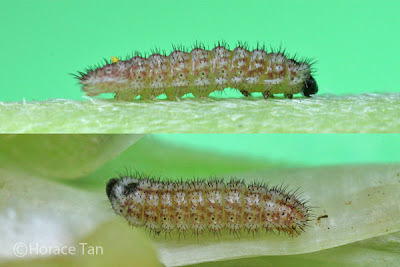 Two views of a 3rd instar caterpillar. green form, length: 6.5mm. 3rd instar caterpillars. red and intermediate forms, length: 8mm. The 4th (and final) instar caterpillar is similar in appearance to the 3rd instar caterpillar with one main difference being the change of head capsule from black to pale yellowish brown, and the spiracles from black to pale yellow or white. The nectary organs are rather prominent in this instar as well. 4th instar caterpillars of two colour forms. early in this stage, length: 8mm. 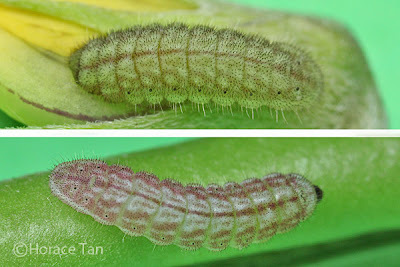 4th instar caterpillars, late in this stage, lengths: 12mm (top); 14mm (bottom). Both are eating seeds in seed pod. 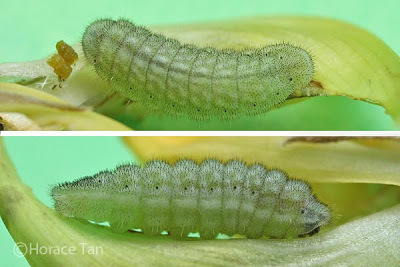 After 3.5-4 days of growth and reaching a maximum length of around 14-15mm in the final instar, the body of the caterpillar gradually shrinks. The caterpillar ceases eating and wanders around for a pupation site. All bred specimens chose to enter their pre-pupatory phase on a spot of the leaf surface within a pile of withered leaves.. At the chosen site, the caterpillar readies itself for pupation by spinning a silk girdle and a silk pad. In the wild, some caterpillars also choose to pupate within seed pods. 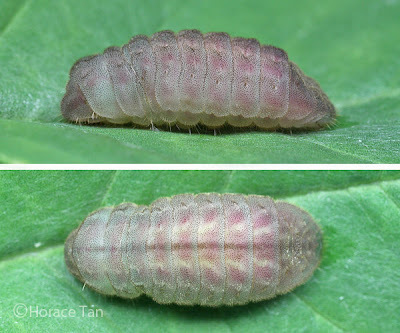 Two views of an immobile pre-pupatory larva of the Pea Blue, red form. 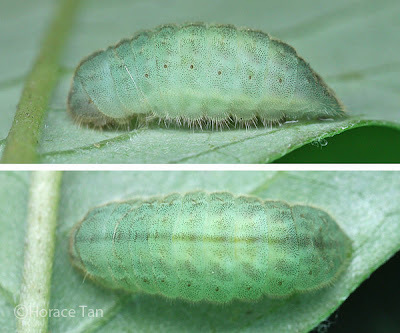 Two views of an immobile pre-pupatory larva of the Pea Blue, green form. Pupation takes place after one day of the pre-pupal stage. 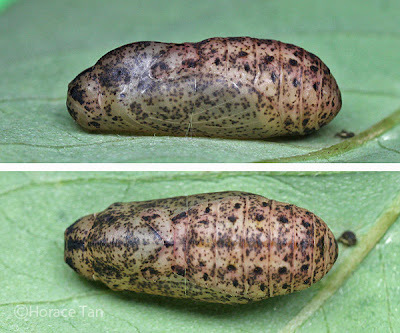 The hairy pupa has the typical lycaenid shape, beige in base colour with many black to dark brown patches on the pupal surface. Unlike most other lycaenid pupae, the pupa of Pea Blue does not secure itself with cremastral hooks, and its posterier end does not angle downwards. The pupa has a length of about 9-11mm. 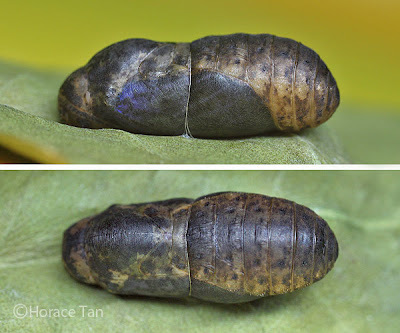 Five days later, the pupa becomes darkened in color signaling the imminent emergence of the adult. 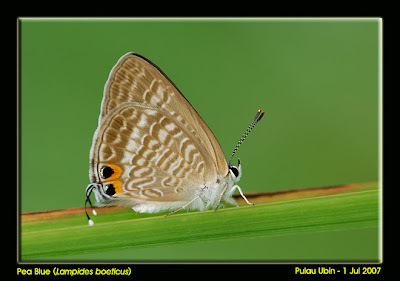 Patches of blue can be seen in the wing pads through the now transparent pupa skin. The next day the adult butterfly emerges from the mature pupa. 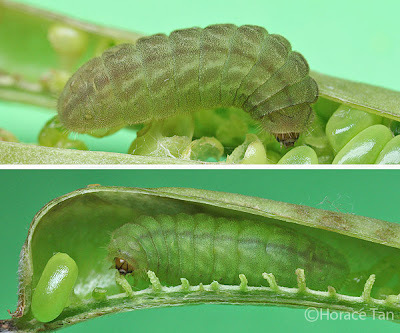 Two views of a mature pupa of the Pea Blue. Early stages of the Pea Blue. 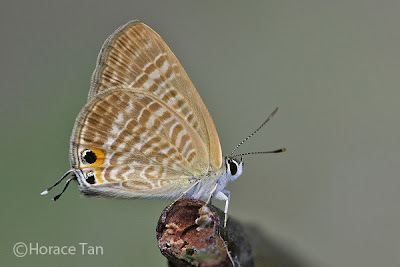 Eclosion of a female Pea Blue. 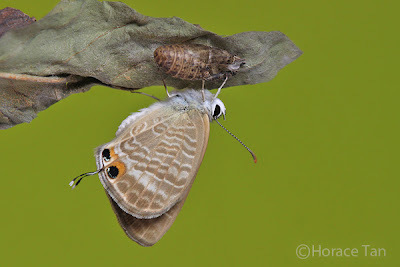 A newly eclosed Pea Blue drying its wings near its empty pupal case. A newly eclosed Pea Blue ready to take its first flight. A Photographic Monograph on Hong Kong Butterflies, Volumes 1-3, Hong Kong Lepidopterists' Society.